Hero MotoCorp has launched the 2017 Pleasure scooter in India priced from Rs. 45,805 (ex-showroom, New Delhi) and goes up to Rs. 47,305 (ex-showroom, New Delhi). 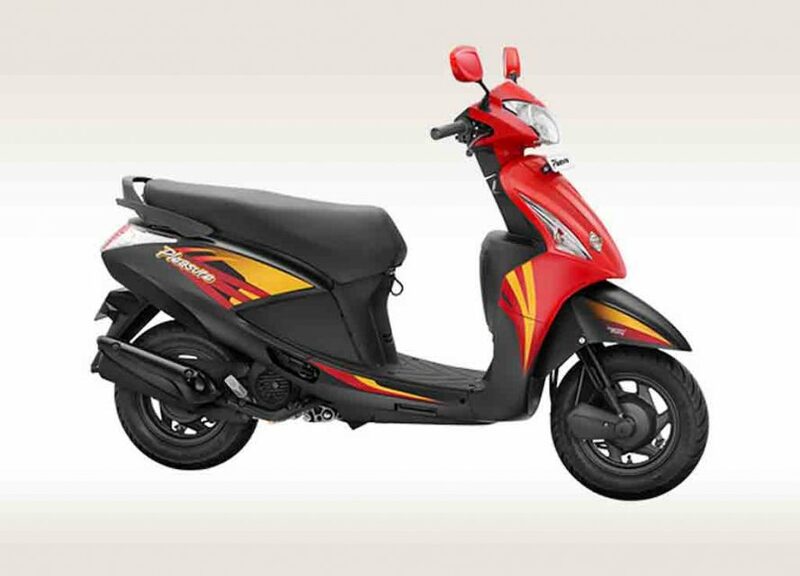 Now, the 100 cc scooter comes sporting Automatic Headlamp On (AHO) technology, sporty and exciting body graphics and new paint scheme along with an upgraded BS-IV engine complying with the new emission rule in the country. 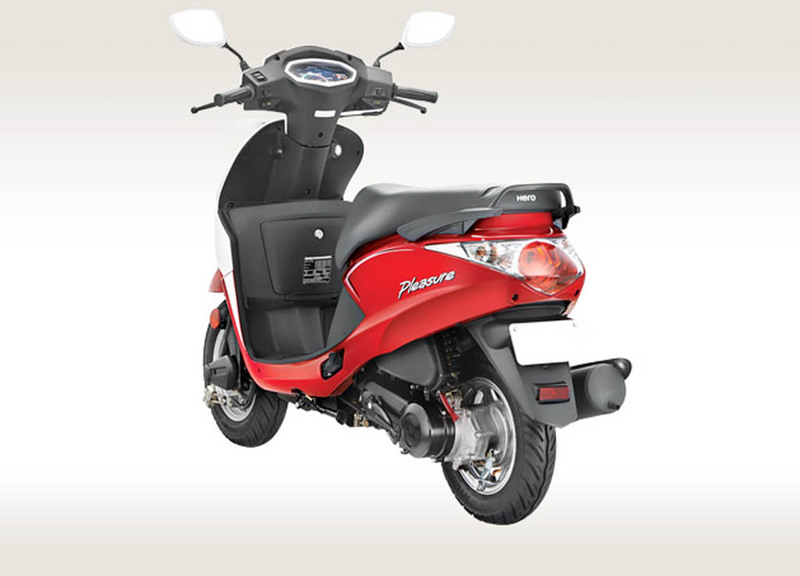 The scooter’s overall design remains unchanged, but new sporty body graphics and new colour scheme have added zing to the model. Apart from that, it gets new AHO tech complying with new rule. Also, some new features have been introduced to the 2017 Hero Pleasure in an attempt to make it more appealing than the previous one. The scooter also gets a side stand indicator, front storage compartment along with mobile phone charging socket. In terms of design, the Hero Pleasure scooter gets a large headlamp, sharp vertically positioned turn indicators at the front cowl. It is available in seven different colour options, which are – Matte Grey and Red, Matte Grey and Yellow, Matte Grey and White, Pearl White, Fiery red, Bold Black, Matte Grey. The scooter offers decent room at the footboard, while the seat delivers comfortable seating experience. The underseat storage comes with decent space and it gets a light as well. The rear of the scooter sports a wide taillight with integrated turn indicators. 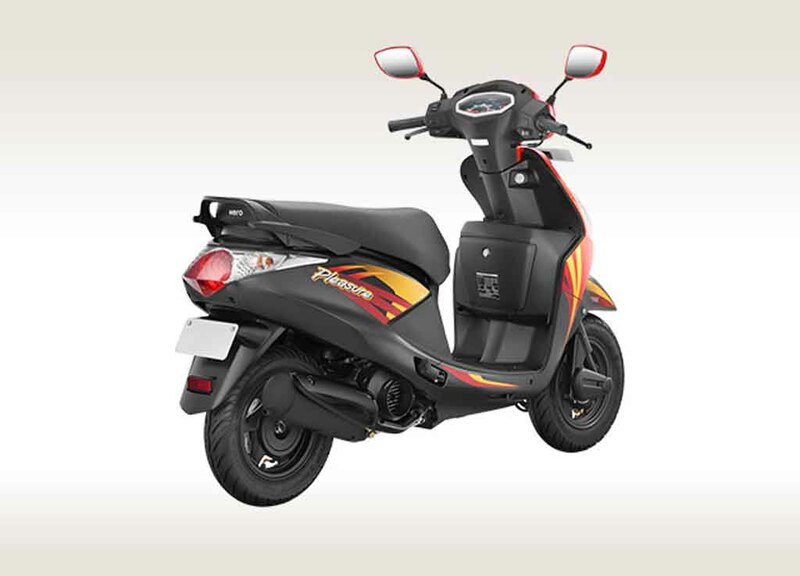 Power source for the scooter is a 102 cc single-cylinder, air-cooled engine mated to a CVT and capable of churning out 6.9 bhp of peak power at 7,000 rpm and 8.1 Nm of peak torque at 5,000 rpm. The 2017 Hero Pleasure scooter is capable of running at a top speed of 77 kmph and it returns around 63 kmpl of fuel efficiency. It runs on alloy wheels wrapped with tubeless tyre and braking duty is done by drum brakes. For suspension duty, it gets bottom link with spring loaded hydraulic damper at front, while rear gets unit swing with spring-loaded hydraulic damper.